Does your mood seem to mirror the seasons — maybe growing darker as the fall and winter days get shorter and lifting as the brighter days of summer approach? You could have a condition known as seasonal affective disorder (SAD) — a type of depression that’s related to seasonal changes in light. Both children and adults can get SAD. However, it usually develops between the ages of 18 and 30. Women are affected at about three times the rate of men. Some evidence suggests that the farther you live from the equator, the more likely you are to develop SAD. Although SAD is typically considered a fall and winter disorder, in a small number of cases symptoms may be triggered by the longer, brighter days of summer. Some people also experience symptoms during periods of overcast weather, regardless of the season. A diagnosis of SAD is based on your symptoms and history. Symptoms of typical SAD must return every winter for three consecutive years and then completely disappear in the spring and summer. If your symptoms are particularly bothersome, light therapy may be recommended. This involves using special lighting while indoors. Therapeutic lighting is much more intense than standard lighting and has been shown to decrease levels of melatonin in the brain. Your doctor can help you decide how long to spend in this lighting and the best time of day to do so. 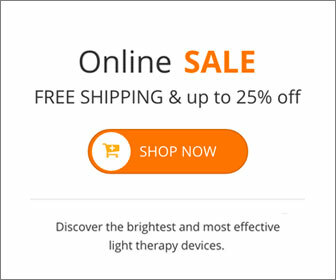 For many people with SAD, light therapy is very effective. However, if it doesn’t work for you, your doctor may have other suggestions, including taking medicine for depression. With proper treatment, SAD is manageable. This entry was posted on Monday, February 15th, 2016 at 10:20 am	and is filed under Light Therapy, SAD. You can follow any responses to this entry through the RSS 2.0 feed.